The ‘Where To Look’ Method. To determine the altitude and azimuth of a celestial body, we could make calculations by using mathematical formulae; we could compute them with the aid of sight reduction tables; we could use star globes and star charts or we could use computer software. However, all of these procedures only tell us what the altitude and azimuth of the chosen body would be at our assumed position which is only an approximate position. The only way that we can determine the altitude and azimuth of a celestial body at our true position is by making accurate measurements with a sextant and an azimuth-compass or similar equipment. However, before we can do this, we must obviously be able to locate the body in the sky. The ‘Where To Look’ Method enables us to quickly and easily calculate which stars and planets will be above our horizon at the time that we wish to make a ‘fix’. It is quite a useful method, especially in the cramped confines of a chart-table, in a rough sea. It is emphasised that this is not intended to be a method of accurately pin-pointing the position of a star or planet but a simple and quick method of establishing whether or not the body is likely to be visible at the time an observation is required and if so, what its approximate position will be in the sky. The following extract is taken from ‘Astronomy for Astro Navigation’ which is a companion book to ‘Astro Navigation Demystified’. Method. To find if a star or planet will be above the horizon at our position at the time of the planned observations, we need to take two things into account, its local hour angle and its declination. Local Hour Angle (LHA). For a star or planet to be visible, its meridian must be within 90o east or west of our estimated longitude at the time of the planned observations. If a body’s LHA is greater than 270o but less than 360o then 360o – LHA will be less than 90o and the body will be above the eastern horizon. Star X: LHA 22o, Dec. 65oN Star Y: LHA 295oE, Dec. 20oN. Since the LHAs of these bodies is either less than 90o or greater 270o, they will be visible above the horizon. 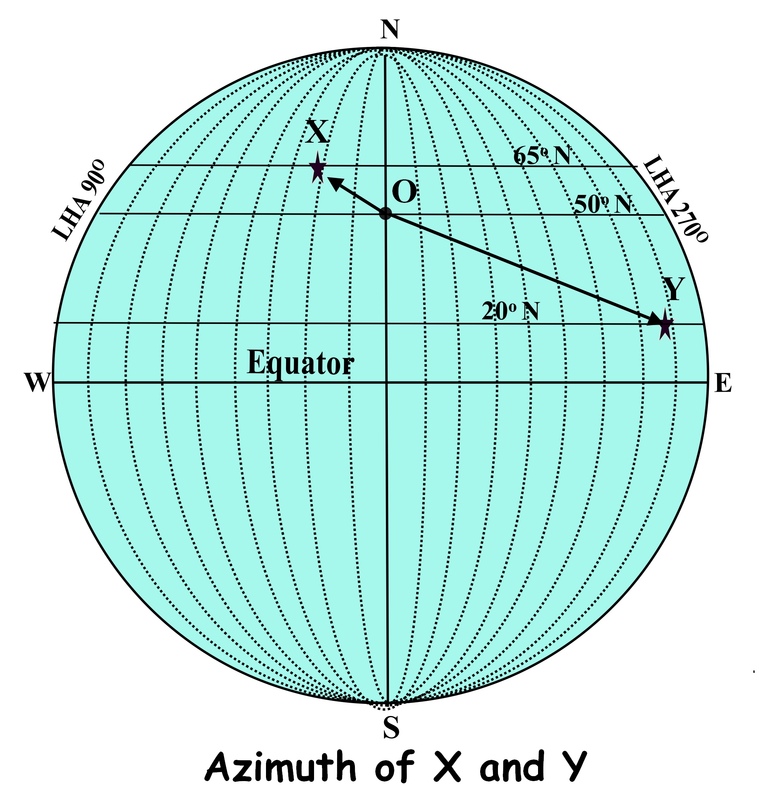 To Calculate Azimuth. Once we have ascertained the LHA and declination of a celestial body, we can make a rough approximation of the azimuth by plotting the LHA and declination in relation to the observer’s assumed position on the azimuth diagram. The full procedures for making these calculations is shown in detail in the books Astronomy for Astro Navigation and Astro Navigation Demystified. We can explain the reason for this rule with the aid of another diagram which shows the declinations of the celestial bodies X, Y together with a third body, planet V. Please note that the diagram is for illustrative purposes only; for this reason, it is not drawn to scale and angles are not drawn accurately. O is the position of the observer at latitude 50oN and Z is the zenith at that position. The line PQ forms part of the visual horizon at point O and is tangential to the circumference of the Earth. C is the centre of the Earth and the line CZ is perpendicular the visual horizon. The line ACB is the celestial horizon which is perpendicular to CZ and therefore horizontal to the visual horizon. The celestial horizon will cut the circumference of the Earth at latitudes that are 90o to the north and to the south of the observer’s latitude (in this example, latitude 40oN and latitude 40oS). V is the position of planet V in the celestial sphere and V1 is its geographical position. 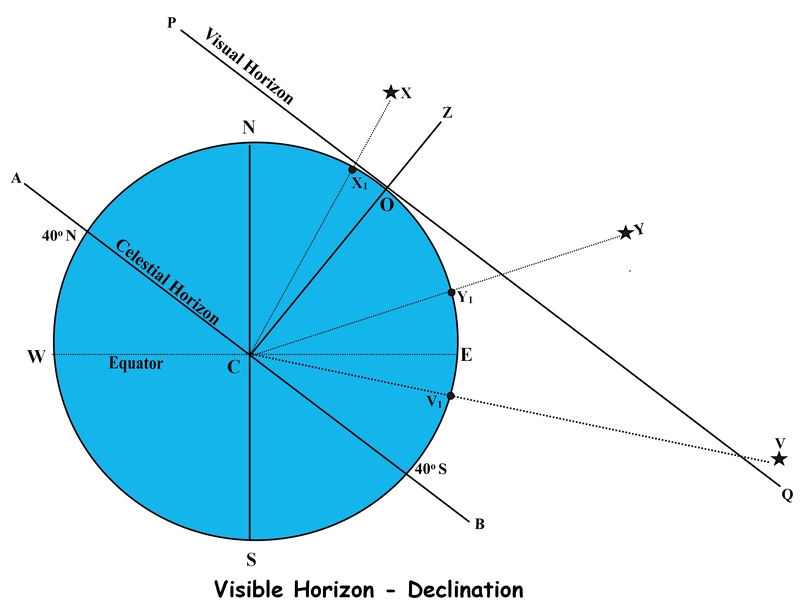 The diagram shows that although the geographical positions of X and Y are below the visible horizon and therefore out of sight to the observer, the bodies themselves are above the celestial horizon and therefore since they are within the limits for LHA and declination, they will be visible above the horizon at the observer’s assumed position. The diagram also shows that V would have been above the celestial horizon but for one thing. Because its LHA is 190o which is greater than 90o but less than 270o, it is outside the LHA limits and therefore will not be above the horizon. Estimating Approximate Altitude. This method enables us to calculate the approximate altitude of a celestial body when it lies over the meridian of the observer; in other words when LHA equals 0o or 360o. When the LHA of a body is greater than 0/360 (i.e. when it is not over the observer’s meridian) adjustments have to be made to the calculated altitude. Calculating the Altitude of Stars X and Y and planet V at noon. We can modify the previous diagram to help us with these calculations. In the diagram, Angle ACN is the angle between the Celestial Horizon and the direction of North and NCX is the angle between the direction of North and the direction of X. Angle ACX is equal to the sum of these angles and represents the altitude of X which is 85o. Angle BCE is the angle between the Celestial Horizon and the Celestial Equator and ECY is the angle between the direction of East and the direction of Y. BCY is equal to the sum of these angles and represents the altitude of Y which is 60o. Angle BCV is equal to angle BCE minus the declination of V and represents the altitude of planet V which is 30o. However, as discussed earlier, V would not be visible because it is outside the limits for LHA. With a little practice, it will become an easy task to estimate the azimuth and altitude of a body without the aid of diagrams. Calculating altitude when LHA is not zero. We must remember that the altitudes we have calculated above would apply when the celestial bodies are over the observer’s meridian (i.e. when LHA is 0o). Therefore, when the LHA is other than 0o, we have to re-calculate the altitude. 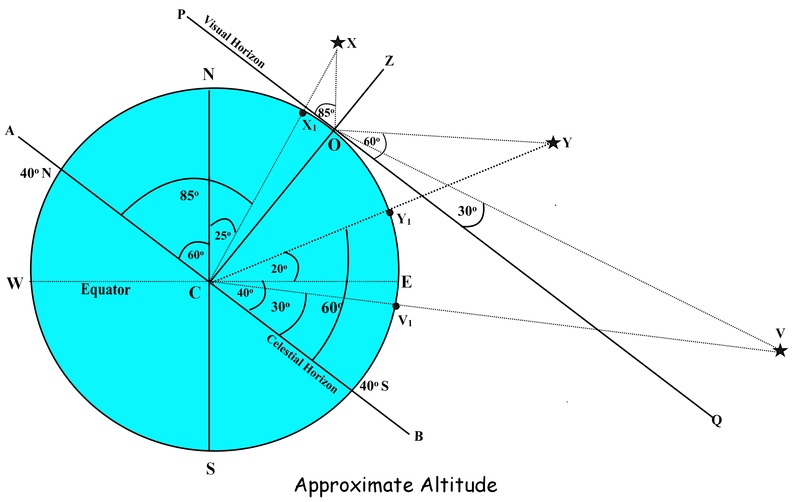 The diagram above shows that the altitude of star X is 85o. Therefore, 22o of LHA = (85 / 90) x 22 = 20.7o of altitude. Therefore Estimated altitude of X when LHA is 22o = 64.3o. The diagram shows that the altitude of star Y is 60o. But LHA = 280o = 80o E.
Therefore 80o of LHA = (60 / 90) x 80 = 53.3o of altitude. Therefore, Estimated altitude of Y when LHA is 80o = 6.7o. We cannot make a recalculation for planet V because its LHA is outside LHA limits. Of course we cannot find an accurate solution to a spherical problem with straight-line, two dimensional, drawings such as these which do not take account of phenomena such as refraction and parallax or the fact that the Earth is not a perfect sphere. However, this method does give us a good idea where to look in the sky for a celestial body that we have selected to use for an accurate position fix. It is also stressed that the drawings above are for illustrative purposes only, are not drawn to scale and that angles are not accurately drawn. The procedures for making these calculations are shown in detail in the companion books Astronomy for Astro Navigation and Astro Navigation Demystified. This entry was posted in astro navigation, Astro Navigation Topics, astronomy, celestial navigation, trigonometry and tagged astro navigation, astronomy, celestial navigation, Planning star and planet observations. Bookmark the permalink.